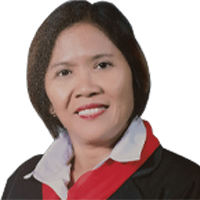 She was graduated from University of The Philippines Diliman, batch 1986, with a degree of Bachelor of Arts in Economics. She has been working in real estate industry for 27 years now and specializes in brokerage in Industrial and Commercial Lease, Sell and Buy. Permanent employee of LGU Sablayan, Occ. Mindoro – Economist III and designated as Local Economic and Investment Promotions Officer since 2011. He graduated B.S.B.A. Major in Accountancy in Central Colleges of the Philippines (CCP) on year 1985. He has been working real state for 21 years. He specializes in project selling in Residential Houses, Condos and Townhouses. Accredited with SM Development Corporation and JKY Development Corporation. He graduated Bachelor of Accountancy in Polytechnic University of the Philippines Sta. Mesa on year 1983. He has been working real state for 17 years. He specializes in brokerage in Residential Houses, Condos and Townhouses; Commercial Leasing, Selling and Buying. Accredited with DMCI, ALVEO, CAMELLA, FILINVEST. She was a graduate of Bachelor of Science in Chemistry in Far Eastern University on year 1977. She is currently studying Masters of Business Administration in University of Makati. She has been working in real estate for 35 years specializing in brokerage in Residential Houses, condos and Townhouses; Commercial Leasing, Selling and Buying.